DRM Buster is aimed to remove limitations from your protected video and audio. It can convert both regular and protected media files to unprotected format, which suits exactly your needs. No matter where you want to use YOUR purchased music or clips. Just convert them with DRMBuster and enjoy your WMV, AAC, M4P, MP4, M4V, WMA, RAX and ANY others format to MP3 (to listen it anywhere) or directly to your iPod/iPhone. DRMBuster allows you to convert practically any popular video formats e.g. WMV, M4V, MPG, MOV, FLV, VOB, MKV, 3GP, RM both protected and non-protected, for use with any type of video playing devices: iPod, iPhone, Zune any portable MP4 players, DVD & DivX players, car video and cell phones. DRMBuster can convert WMV (Windows Media Video) files to regular MPEG4 files (MP4) for use on iPod devices and portable MP4 players; convert M4V (iTunes video) to DivX format for home DVD & DivX players. DRM Buster removal software can easily convert WMA (Windows Media Audio) files purchased from Napster To Go, Yahoo Music, Rhapsody, Wal-Mart, MSN Music and many other music stores; iTunes audio to MP3 format (M4A, M4B, M4P, AAC to MP3); Real Audio (RAX, RA, RAM) files from Rhapsody store; Sony’s proprietary compressed music formats (ATRAC, OMA, OMG) taken from Sony CONNECT Music store; Audiobooks (AA, M4B, WMA) downloaded from Audible, iTunes store; OGG Vorbis audio files, …conversion for audio files. 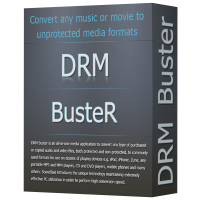 With DRMBuster converter you can enjoy any purchased or legally obtained song or movie on your iPod, iPhone, Zune, any other MP3, MP4, DivX or DVD player, CD player, car audio & video, mobile phone or PC – without any restrictions and DRM protection. For example DRMBuster can convert WMV movies from CinemaNow with original video quality; rip protected music and video files from iTunes (M4P, M4V); Rhapsody (RAX, WMA); Napster To Go (WMA), Yahoo Music (WMA), Audible (AA), Sony CONNECT Music (ATRAC) etc. Converted songs and videos have NO restrictions anymore ! Bonus : free YouTube Ripper included !